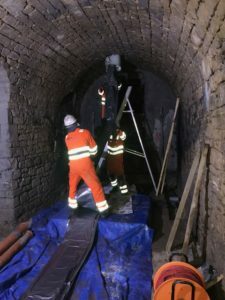 OnSite Central Ltd were tasked with providing a solution for repairing a defective, 125 year old, 50m length of 225mmØ foul sewer, which ran through the vaults of a Victorian building that is now one of the most prestigious hotels in central Bath. Access to the site was such that even completing an initial CCTV investigation required a very demanding confined space entry. 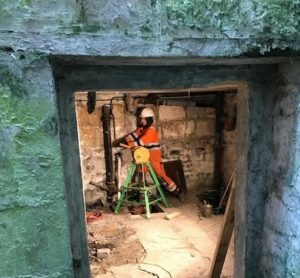 The survey was carried out from an existing manhole inside a vault, downstream to the main sewer that was directly above an old coal bunker. 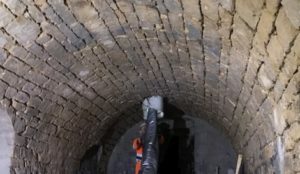 The survey identified that the sewer was suffering from heavy encrustation and scale build up and was heavily fractured adjacent to a live lateral connection. Specialist contractor Aqua Management Ltd, enabled access to main sewer by drilling a temporary access tunnel from a vault above the coal bunker, through the main sewer and into the coal bunker. The encrustation & scale within the sewer was removed using one of OnSite’s hydraulic cutting robots from the upstream manhole inside the vault. The arisings were then removed with a bespoke “pig” cleaning system which was winched through the sewer from the new tunnel access inside the coal bunker. The liner was then manually winched into position from the new access point in the coal bunker to the upstream manhole in the vault. The UV light train was installed from the same manhole into the liner, and cured in place. All works were programmed between Onsite Central Ltd & Aqua Management who collaborated to complete this challenging engineering task in a remarkable three days.